Registered Nurse, Free Care Plans, Free NCLEX Review, Nurse Salary, and much more. Join the nursing revolution. This is a quiz that contains NCLEX review questions about COPD (chronic obstructive pulmonary disease). Patients who have COPD are experiencing limited airflow due to obstructive pulmonary disease. COPD limits gas exchange which can lead to serious complications that affect the rest of body, such as the heart. In the previous NCLEX review series, I explained about other respiratory disorders, so be sure to check those reviews out. As the nurse, it is important to know how to care for a patient with COPD. In addition, the nurse needs to be aware of the causes, risk factors, and management of COPD. The NCLEX exam loves to ask questions about patient education, major signs and symptoms, and the different types of COPD. 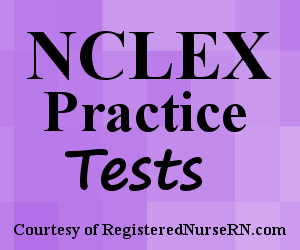 This quiz will test your knowledge about COPD (chronic obstructive pulmonary disease) in preparation for the NCLEX exam. A. "If I stop smoking, it will cure my condition." B. "Complications from this condition can lead to pulmonary hypertension and right-sided heart failure." C. "I'm at risk for low levels of red blood cells due to hypoxia and may require blood transfusions during acute illnesses." D. "My respiratory system is stimulated to breathe due to high carbon dioxide levels rather than low oxygen levels. A. "It is best to eat three large meals a day that are relatively low in calories." B. "Avoid going outside during extremely hot or cold days." C. "It is important to receive the Pneumovax vaccine annually." D. "Smoking cessation can help improve your symptoms." A. The patient should use the medications every 2 hours for acute episodes of shortness of breath. B. The patient should use the Spiriva first and then 5 minutes later the Pulmicort. C. The patient should use the Pulmicort first and then the Spiriva 5 minutes later. D. The patient should use the medications at the same exact time, regardless of the order. A. The patient rinses their mouth after using the Spiriva inhaler. B. The patient rinses their mouth after using the Pulmicort inhaler. C. The patient dispenses of the inhalers. D. The patient coughs 2 times after using the Pulmicort inhaler. 1. True or False: COPD is reversible and tends to happens gradually. 2. A patient is presenting with chronic obstructive pulmonary disease. The patient has a chronic productive cough with dyspnea on excretion. Arterial blood gases show a low oxygen level and high carbon dioxide level in the blood. On assessment, the patient has cyanosis in the lips and edema in the abdomen and legs. Based on your nursing knowledge and the patient’s symptoms, you suspect the patient suffers from what type of COPD? 3. A patient with emphysema may present with all of the following symptoms EXCEPT? 4. The term blue bloater is used to describe patients with? 5. A patient is newly diagnosed with COPD due to chronic bronchitis. You’re providing education to the patient about this disease process. Which statement by the patient indicates they understood your teaching about this condition? D. “My respiratory system is stimulated to breathe due to high carbon dioxide levels rather than low oxygen levels, as with people who have healthy lungs. 8. A patient with severe COPD is having an episode of extreme shortness of breath and requests their inhaler. Which type of inhaler ordered by the physician would provide the FASTEST relief for the patient based on this particular situation? 10. A patient is ordered by the physician to take Pulmicort and Spiriva via inhaler. How should the patient take this medication? 11. In regards to question 10, which action by the patient demonstrates they know how to properly use this medication? 13. A patient is ordered at 1400 to take Theophylline. You’re assessing the patient’s morning lab results and note that the Theophylline level drawn this morning reads: 15 mcg/mL. You’re next nursing action is to? 14. You are providing care to a patient with COPD who is receiving medical treatment for exacerbation. The patient has a history of diabetes, hypertension, and hyperlipidemia. The patient is experiencing extreme hyperglycemia. In addition, the patient has multiple areas of bruising on the arms and legs. Which medication ordered for this patient can cause hyperglycemia and bruising? Don’t forget to tell your friends about this quiz by sharing it your Facebook, Twitter, and other social media. You can also take more fun nursing quizzes. *Disclaimer: While we do our best to provide students with accurate and in-depth study quizzes, this quiz/test is for educational and entertainment purposes only. Please refer to the latest NCLEX review books for the latest updates in nursing. This quiz is copyright RegisteredNurseRn.com. Please do not copy this quiz directly; however, please feel free to share a link to this page with students, friends, and others. Enter your email address below and hit "Submit" to receive free email updates and nursing tips. Copyright © 2019 RegisteredNurseRN.com. All Rights Reserved.